Layers of raspberry flavoured jelly, sponge, raspberries and stabilised cream. 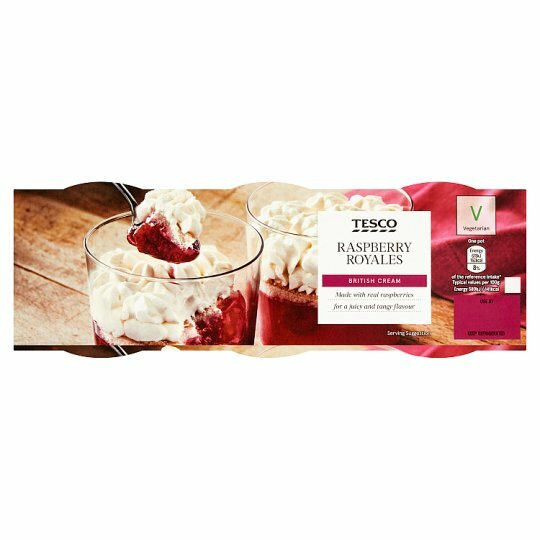 British Cream Made with real raspberries for a juicy and tangy flavour. Our chefs work together to create family favourite recipes using traditional layering as you would at home. INGREDIENTS: Water, Cream (Milk) (24%), Raspberry (12%), Dextrose, Sugar, Wheat Flour, Pasteurised Egg, Stabilisers (Pectin, Locust Bean Gum, Calcium Phosphate), Raspberry Concentrate, Acidity Regulators (Citric Acid, Trisodium Citrate), Milk Proteins, Flavouring, Colour (Anthocyanins).